moof-fuh-LEHT-tuh: Originated in 1906 at the Central Grocery in Louisiana. This sandwich must be made in advance and refrigerated so the flavors have time to meld. 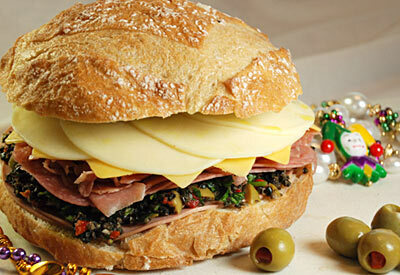 This makes a wonderful party sandwich since there's no fussing in the kitchen when your guests arrive. Prepare the olive salad by combining the olives and roasted pepper, garlic, parsley and vinegar. Take one round loaf (one big round for a traditional Muffaletta or individual sub buns for smaller sandwiches) and cut the loaf (or loaves) in half. Scoop out a little bread from the inside to make room for filling. Drizzle olive oil on each side of the open bread -- use plenty. On the bottom half, layer mortadella, olive salad, salami, prosciutto, mild cheese and provolone. Top with the other half of bread. Tightly wrap entire sandwich in plastic wrap and refrigerate for at least 2 hours. To serve, slice into wedges.